'Zoloty Kliuchyk' (Igor Khorosh, R. 2008) Seedling #IXM-011412. MDB, 6" (15 cm). Early bloom. 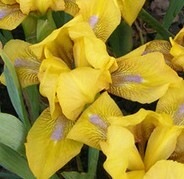 Standards and falls yellow (RHS 12A); style arms yellow; beards pale blue; lightly ruffled; slight sweet fragrance. Parentage unknown. Khorosh 2012. Ukrainian spelling: Zolotiy Kluchik.